If you’ve found yourself wondering how often you should bathe your canine companion, you’re not alone. It’s a common question we get at Anasazi Animal Clinic in Gilbert, Arizona. Though dogs naturally groom themselves to facilitate the growth of hair follicles and promote skin health, bathing your dog is not only recommended for his hygiene, but also for maintaining the health and wellbeing of your household. So, how often should you bathe your pup? Well, that depends on a few factors. Let us explain. Each breed of dog has a unique coat type that plays a big role in the recommended frequency of bathing and grooming. Long and medium-haired breeds generally need to be bathed more than short-haired breeds. Dogs with medium-to-large coats might need to be bathed as much as weekly or as little as once every 4-6 weeks. Some breeds have a double coat, which consists of a softer undercoat that serves to both insulate in the winter and cool in the summer, and a thick outer coat that protects them from the elements. 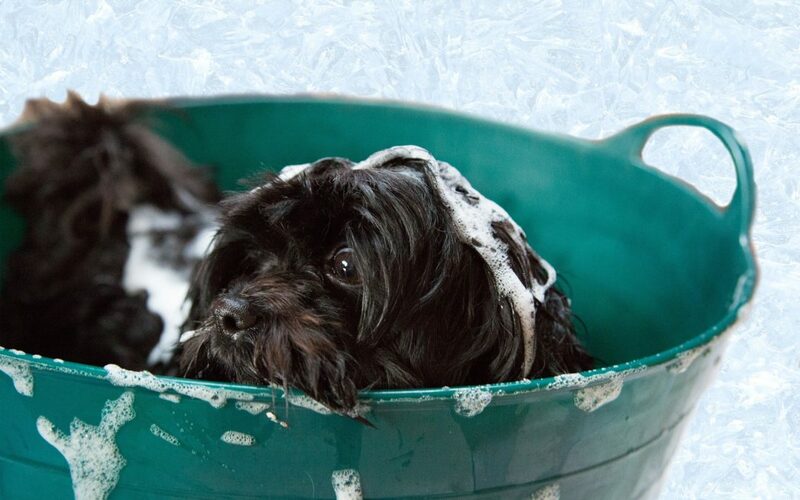 Double-coated dogs tend to shed more, and bathing can be a helpful way to keep this process under control. But you’ll want to be careful not to over-bathe your dog, which will strip the natural oils from their skin and coat. If your pup is the type that loves to get down-and-dirty at the dog park, or plays outside for extended periods of time, then he may need to be bathed more frequently. Alternatively, healthy dogs that spend the majority of their time indoors may only need to be bathed a few times a year. One trick to use is your sense of smell. If your dog walks into the room and you can smell him, then it’s probably time for a bath. If your dog suffers from a skin condition, we may recommend a special medicated shampoo, along with a bathing regimen. And if a human in your household also has allergies, bathing your dog on a more regular basis will help keep loose hair and dander out of the environment. In addition to bathing your dog, one key to a healthy coat and skin is regular grooming. Brushing your dog frequently to remove loose hair, dead skin cells, and dirt or debris from the coat is imperative to Fido’s wellbeing. If you have any remaining questions about bathing and grooming, we’ll be happy to answer them when you bring your pup in to see us at Anasazi Animal Clinic in Gilbert. Being able to observe the condition of your animal’s coat and skin and asking you a few questions will give us a good idea of how to help you keep your furry friend in optimal health!